A unique and unforgettable place to stay in "...the spiritual centre of Ireland"
We provide a wide range of comfortable, affordable accommodation ... from, en-suite double, twin and family rooms in our Mill House B&B, which also has two luxury, self contained Apartments. Our Glamping facilities comprise ... eight, fully furnished, Glamping Bell Tents: five quirky bedrooms in a 150-year-old mahogany Railway Carriage and what some consider "the jewel in the crown" or the "honeymoon suite" ...a converted Fishing Trawler Wheelhouse ... as well as a Motor-home/Caravan Park and a private tent, campsite on our lawn - a virtual Holiday Village, in fact! The 18th century Mill House was totally rebuilt in 2000 from its three remaining walls but fitted out with authentic, antique flooring, radiators, furniture, and memorabilia to achieve the old-world charm which guests appreciate. The 150-year-old, mahogany railway carriage (exactly like that in the famous Quiet Man, movie) was restored and rebuilt on site to house 5 sleeping compartments (two with double beds and three with two, twin-bed, bunks in each). All linen is included and dedicated showers, toilets and kitchen are available to all Glampers. The newly restored and converted, Fishing Trawler - The Larry McQuaid - has to be one of the most quirky and romantic Glamping units in Ireland, with unbeatable views of Horn Head, New Lake Nature Reserve and Tory Island sunsets. The trwaler has its own cooking facilities and shower/toilet. 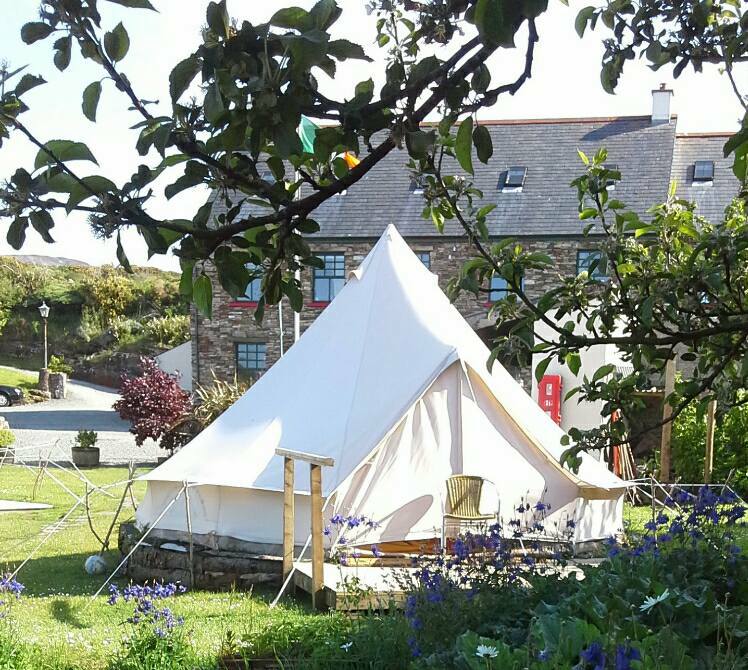 Follow your dream in our fairyland, glamorous Bell Tents where our guests enjoy “quirky”, quality, memorable experiences in great comfort . Bedroom furniture, linen and lighting are all included. Our small, informal campsite, beside the mill stream on the Mill Cottage Lawn, suits those seeking an adventurous experience as close to nature as possible but in a safe, peaceful environment with dedicated showers, toilets and kitchen available. Our small, quiet, two-level Motorhome Park with electrical hook-ups for up to 10 motorhomes or caravans, dedicated toilet/shower rooms, with facilities for recycling waste and fresh water resupply.